G U L F - F R O N T - Blue Mountain Villas - Closest to Beach! describe this cozy, remodeled retreat! This Non-Smoking, Gulf-Front Condo is one of the closest structures to the water's edge as it was built before the newer coastal setback requirements. In other words, you're practically ON the beach...don't settle for less! From this ground floor, end unit, take just 3 steps from your patio and you're standing at the top of the beach walkover stairs looking down on one of the most beautiful beaches anywhere!! You can see all the way to Destin via the side picture window. 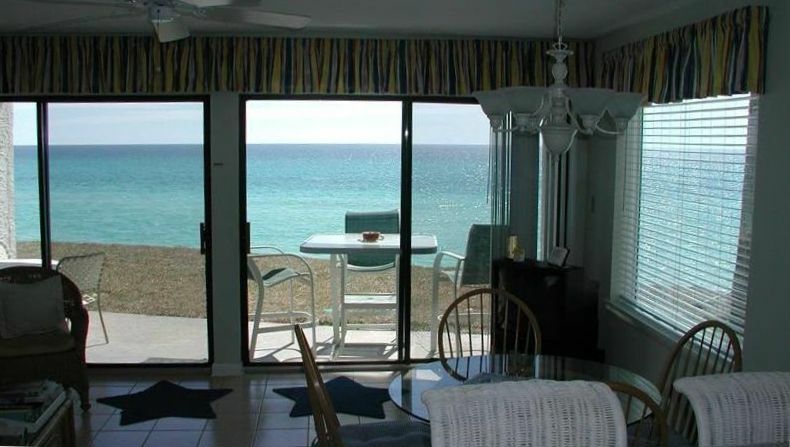 There are 2 sets of sliding patio doors which provide 16 feet of gulf-front view. The resulting panorama is wonderful! The living and dining area are gulf-front. The bedroom has a king bed while the living area has a queen sleeper sofa. There are 2 cable TVs as well as a DVD player. The entire unit is tiled except for the bedroom which has bamboo hardwood flooring. The attached 'carport' can be used to park your bikes out of the rain (not for vehicles). The unit is located on quiet Blue Mountain Road which is a side street off of 30-A highway. FREE long distance calling provided. NOTE!! Check out our LIVE 'beach-cam' on our main website. --Please, you must be at least 25 years old to rent this property. We are a husband and wife team that fell in love with the Blue Mountain Beach community. We were both born in Atlanta in the same hospital, 2 weeks apart and attended the same high school. Marietta, GA has been our home for over 20 years. Blue Mountain Villa Townhomes are located closer to the gulf than any other condominiums in the Blue Mountain Beach community. And because this is a west end unit with west facing windows, the views are unmatched! Our unit is literally the closest to the beach walkover. We self-manage our two units at Blue Mountain Villa Townhomes (listed on VRBO since 2003). As such we provide personal attention that is sometimes lost with the big rental companies. The unit has been listed on VRBO since 2003 so you can rent with complete confidence. West end unit provides unobstructed views to the gulf and to the west along the shoreline all the way to Destin. Free long distance to U.S. Regular towels provided but please bring your own beach towels. WIRELESS INTERNET ACCESS included!! Sorry, NO PETS allowed. Blue mtn is one of our favorite spots on 30a and Blue mtn villas is one of the best on the beach. This villa on the corner with extra “side” window really gives you the feel of actually staying on the beach. Villa has everything you need and the owner is extremely helpful in all aspects. The weather was near perfect during our 2-week stay. Every day but one was sunny, with blue skies and nice winds. I think this was our seventh or eighth year, so we feel no need to leave our cozy nest at Blue Mountain. We relax, read books, chat with old friends, and watch the sea for dolphins. It just doesn't get better than this. A beautiful condo with a breathtaking view! The condo was clean and well maintained. Everything we needed was there. Best sunset ever. Great location. We spent 3 days at Blue Mountain Villas before Hurricane Michael made it's debut. The beach is beautiful and just down the steps from unit 5B. The unit is perfectly located and very nice. You have everything you need and the view only makes for a great stay. The living room furniture could use a little updating but was comfortable and there was adequate seating for guests. The bed is really comfy and there's plenty of room to move around. There's a full sized washer/dryer unit which comes in very handy especially if you stay very long. Blue Mountain Villas is close to tons for restaurants and to Publix and Walmart. But,with it's private beach area, you won't be crowded off the beach. Mr. Serrero, the owner, was fantastic to deal with. He really went over and beyond to make sure we were happy. We will definitely be back!! A 17 mile bike & walking trail along scenic 30A takes you to the beaches of Dune Allen, Grayton, WaterColor, Seaside, Seagrove, WaterSound, Seacrest & Rosemary Beach. There are nearby rentals for bikes, kayaks, etc. Swimming, paddle boarding, kayaking & golfing ensure fun-filled activities. Walk up the road to get a relaxing massage or to Blue Mountain Creamery for their famous ice cream that can't be missed. Silver Sands Outlet Mall is just a few miles down the road. Great restaurants are located nearby including the popular Red Bar in Grayton Beach, Marie's Bistro, Goat Feathers, Basmatis, 30A Restaurant, Borago, The Bay, Hurricane Oyster Bar, Vue on 30A, Stinky's, Local Catch & many others. Spring, summer and fall rentals are weekly only and go from Saturday to Saturday. But we will consider a rental of less than a week if the period is still available within 10 days of your desired arrival date. Rent + Cleaning + Tax = Your Total (no other junk fees!) Damage deposit is FULLY REFUNDABLE if unit is returned per agreement. Rent with confidence - listed on VRBO since 2003.